Landslides, which all too often kill people, destroy homes and disrupt transportation networks, could increase in the coming years as a result of climate change. A new report commissioned by the Puget Sound Institute looks at what we might expect in the region, especially during the winter months when rains and flooding reach their peak. PSI senior writer Christopher Dunagan brings us part one of a three-part series on some of the report’s findings. The 2014 Oso landslide in Snohomish County was the deadliest landslide in U.S. history, taking the lives of 43 people, destroying 49 homes and blocking State Route 530—the main road into the small town of Darrington. Soil conditions—especially saturation from winter rains—were determined to be a contributing factor in the slide, according to investigators. Although Oso was a rare event, major rainstorms in the Puget Sound lowlands are known to bring dozens of landslides, causing great risk to life and property. Even in a normal year, the Washington Department of Transportation budgets about $15 million a year just to deal with landslide problems. Oso, WA landslide. A view from a Washington Army National Guard helicopter shows trees that were at the very top of the hill when the mudslide occurred now lie across the slide’s width like a woven belt. Landslides are frequently triggered by saturated soils and heavy rains, and those conditions are expected to occur more frequently as a result of 21st century changes in climate, according to projections by leading climatologists in the Puget Sound region. The danger of increasing landslides is among the issues presented in a new report that pulls together the best information known about climate change’s regional impacts. Other concerns not specifically related to landslides include increasing floods, declining salmon runs and the potential for greater health problems among the human population. The report, called “State of Knowledge: Climate Change in Puget Sound,” was produced by the Climate Impacts Group at the University of Washington. 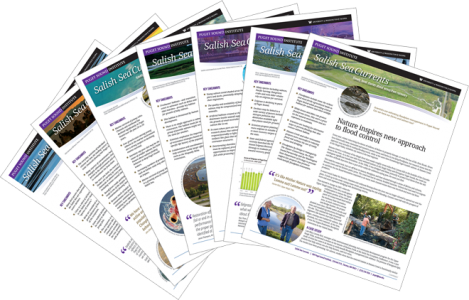 The UW Puget Sound Institute commissioned the report with funding from the Environmental Protection Agency. Additional funding came from the National Oceanic and Atmospheric Administration (NOAA), and from Washington State. Although the report stops short of predicting an increase in the number of landslides – the science is not yet advanced enough to make such projections – the report outlines a number of reasons we might expect an increase in landslide risk. For example, heavy rain events are projected to get more intense. These could lead to heavier soils, higher groundwater levels and greater lubrication between soil layers, according to the report. “These factors can weaken a slope such that a triggering event (e.g. an intense rainfall event or an earthquake) … may result in slope failure,” the report states. Ronda Strauch, an author of the report, said she hopes the findings will raise people’s awareness about landslide hazards in their own backyards. Properly managing drainage and vegetation around one’s home can reduce the risk of a landslide, said Strauch, a graduate student in civil and environmental engineering at the University of Washington. She is developing a computer model to calculate the risk of landslides under various conditions. In the Seattle area, rains of 1.6 inches or more over a 24-hour period are generally sufficient to trigger landslides when soils are already wet. Shallow landslides occur in the root zone of trees and plants. Shallow slides may emanate as a mudflow, a debris avalanche, or a rockfall. Deep-seated landslides have the capacity to move much larger volumes of earth. Slide areas may appear stable for decades until changing conditions cause a slope failure that brings down massive amounts of debris unexpectedly. “Dec. 1st soil moisture, used as an indicator of landslide risk, is projected to increase by up to 35 percent by the 2040s … along the slopes of the Cascade Mountains,” the report says. The heaviest 24-hour rainstorms in the Pacific Northwest will intensify by 22 percent, on average, by the 2080s, according to the report, which bases this prediction on ten climate models using a high greenhouse gas scenario. “Combined with the projected increase in winter soil moisture, the projected increase in heavy rain events is expected to result in more frequent landslides,” the report says. At the same time, higher streamflows could undercut the banks of rivers, making steep slopes more vulnerable to failure. Sea level rise could have similar effects on steep bluffs along marine shorelines. Higher streamflows in winter are expected in the future, not just because of heavier downpours but also because warmer weather will lead to more of the precipitation falling as rain rather than snow. Average spring snowpack in the Puget Sound watershed is predicted to decline between 42 and 55 percent, on average, by the 2080s. “Snowpack protects soils from raindrop erosion and can also absorb rain,” the report says. “Projected losses in mountain snowpack will reduce the armoring effect of snow and lead to increased soil saturation, landslide hazard and sediment input into streams during winter. Slope stability could be further compromised by forest fires, which can leave the land bare of vegetation that helps hold shallow soils in place. Root decay reduces slope stability in a burned-over area, especially one to three years after the fire. Drought could similarly lead to increased landslide risk. Plants under stress from drought may not survive, and may be more subject to attack by disease and insects. In some cases this could expose soils, leaving a slope more vulnerable to landslides. On slopes with glaciers, the melting ice often uncovers loose deposits of soil and rock that were previously trapped under the glacier. As the glaciers recede, these deposits are free to slide downhill. Glaciers that occupy valleys—such as on Mount Rainier and Mount Baker—help to support the slope above, said Jeff Coe, a landslide expert with the U.S. Geological Survey. “Taking away that slope support at the bottom of the glaciers (through melting) will make the slopes more susceptible to landslide failure,” he said. 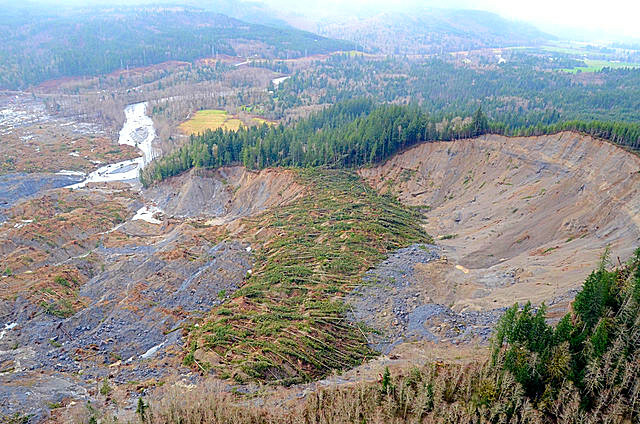 So far, no published studies have predicted the rate of increased landslide risk in the Puget Sound region, but numerous factors are expected to line up to decrease the stability of landslide-prone slopes over time, especially in winter and early spring. One modeling study in the Queets basin on the western side of the Olympic Mountains projected an increase in landslide risk between 7.1 and 10.7 percent by 2045 for areas with high landslide potential. Strauch, who is studying steep slopes in the North Cascades, said she is attempting to quantify the probability of slope failure under various conditions, and then consider how those probabilities might change under changing climate conditions. Until then, researchers are limited in their predictions of how many more landslides will occur in the future. Experts evaluating landslide hazards will need to account for how storm tracks could change, making some areas more vulnerable to sliding and other areas less vulnerable, the report says. Rainfall patterns and temperature will continue to be influenced by short-term climate factors such as El Niño, which often changes from year to year, and by the Pacific Decadal Oscillation, which shifts more slowly over a period of many years. Currently, most landslides take place between November and April, with the greatest number (45 percent) in January. While slopes will be more unstable during winter, soils will dry out sooner, resulting in fewer landslides in late spring and summer. As the report describes, human changes to the landscape—such as clearing for roads, houses or timber harvest—must be factored into the increasing risk of landslides caused by climate change. Next week: How will climate change affect the region’s farmers?